Managing your image editing and conversion processes is faster and easier than ever before with reaConverter's latest edition! Among the convenient features that help you save time and effort, the software includes the possibility to process image files directly from ZIP folders. You no longer need to use a third party program to unzip your image files before conversion, because reaConverter extracts images by itself from zip folders. reaConverter reads ZIP, 7Z, GZ, ARJ, RAR and TAR archives like multipage files. Load all the compressed folders that contain images you intend to process. Add them manually or use the drag-and-drop tool. If you want to check their content, double click on them and open reaConverter's viewer, which includes customized zooming, rotating options and a few other features. Go to the Edit images tab and pick the desired editing options. Here you can rotate, resize, resize, crop or watermark the image, as well as apply a series of other advanced tools, such as adjusting colors, adding photo filters, switching to black and white, and many more. reaConverter treats archive folders as multipage files, so you can alter multipage settings. Go to the Menu button, click Saving settings → Additional saving settings. 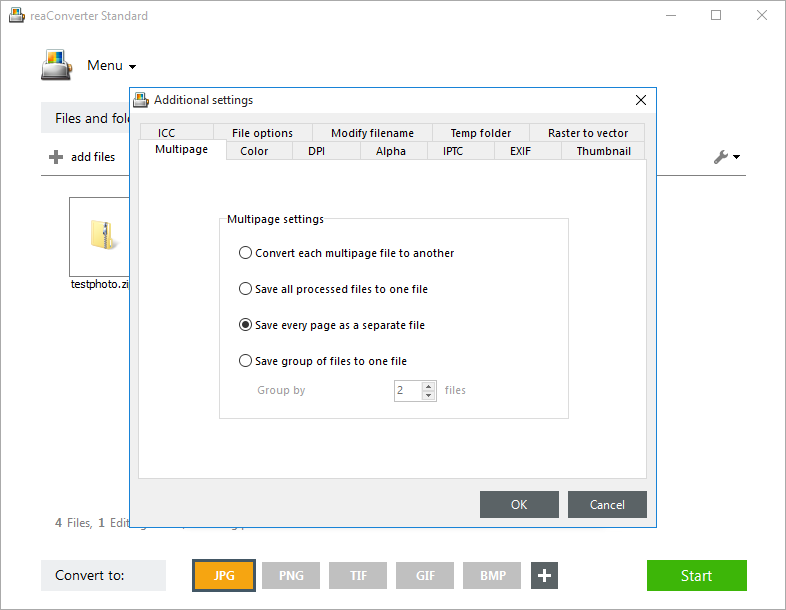 In the Multipage tab you will find here, there are several options to choose from in terms of converting your compressed folders. Go to Saving options and decide on a location for the converted images. You can save them in a local folder of your choice, including the source folder, a subfolder inside it or another customized location. Finally, pick the extension of the output files from the range of buttons placed in the lower part of the window. Then simply press Start and the newly converted images will soon be ready!